The 28.5 metre motor yacht Ocean Drive, listed for sale by Michael Mahan at Worth Avenue Yachts, has been sold with Husam Atiah of Royal Marine International introducing the buyer. Designed by Stefano Righini, Ocean Drive was built in GRP by Italian yard Benetti to RINA class and MCA coded with delivery in 2012 as a Delfino 93’ model. A neutral interior by Carlo Galeazzi employs natural oak joinery, steel and glass to create a pleasant ambience accommodating 10 guests in five cabins consisting of a master suite, two VIP suites and two twins, all with en suite bathroom facilities. In addition, there are quarters for four crew. The main saloon has comfortable settees to port and starboard, two occasional chairs, coffee and end tables. Forward is a formal dining area with seating for 10 guests and storage lockers for glassware, china and silver. Aft and to starboard is a walk up bar with ice maker and a mini fridge. The saloon flooring is in a beautiful light grey stained oak. The bridge deck is set up with a helm to port, seating for three and forward facing seating to starboard for three to four guests. Forward on a raised deck are sun pads for three to starboard and for two to port. Aft is a large bar with two bar stools while to port aft of the helm is an L-shaped settee that is perfect for lounging or dining at a table for up to 10 guests. Continuing aft is a Jacuzzi spa tub for six and additional loose furniture seating to port and starboard, and a large sun pad. To starboard there is a custom stainless steel barbecue grill and the bridge deck is equipped with a hard top over the forward helm and seating area. The hard top has a powered opening top allowing shade or sun as desired. 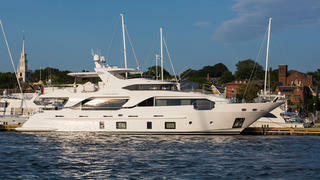 Twin 557hp MTU diesel engines give her a range of 1,500 nautical miles at her cruising speed of 12 knots. Never chartered and under the same ownership since delivery,Ocean Drive was asking $5,950,000.